I shot a photo this afternoon for the New York Times Polling Place Photo Project. "The Polling Place Photo Project is a nationwide experiment in citizen journalism that encourages voters to capture, post and share photographs of this year’s primaries, caucuses and general election. By documenting local voting experiences, participants can contribute to an archive of photographs that captures the richness and complexity of voting in America." 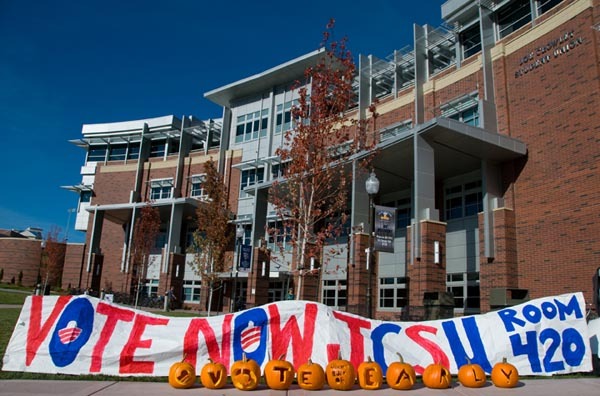 The photo is from the front of the Joe Crowley Student Union at the University of Nevada, Reno following a pumpkin carving for Obama event, hence the orange cucurbitas.